This card is one of, often good, fortune, luck and the sense of being able to have your prayers answered. It is a card that also emphasis’s your own power in the situation – you can make this situation be good for you – it is in your hands to make the intention of what you want to happen and them allow the events to unfold as by your Will. A very magical card and be experienced often as a miraculous result. The wheel is symbolic of movement and the changes, ups and downs we experience in life – the goal of the card is to allow yourself to be centered in the middle of the wheel – where regardless of the external situations you face the inner core of you is stable and centered. As we come to this in ourselves so our lives flow more – we resist difficulties less and cling to the good times less too – as the ‘times’ no longer affect our sense of who we are or our self value. 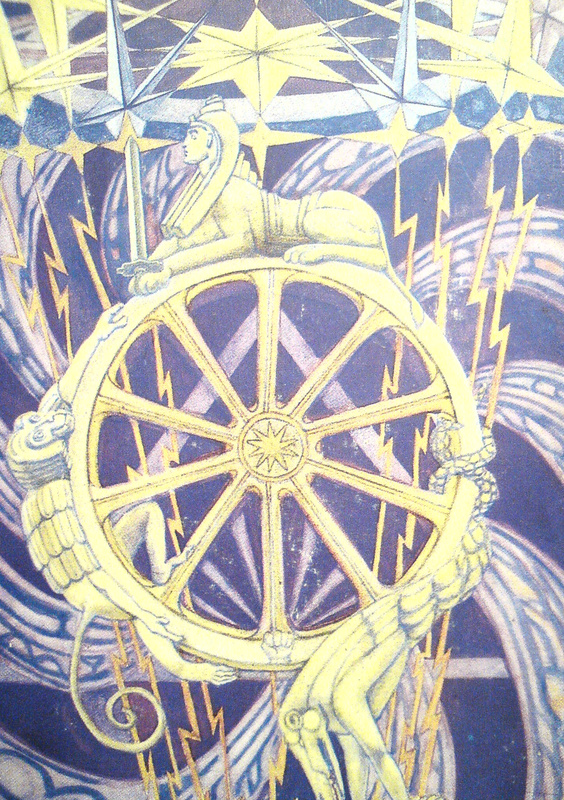 The figures on the wheel are the sworded Sphinx, The Hermanubis or Ape of the Magus, and the Typhon. The Hermanubis/or Ape of Magus is connected with Mercury in Alchemy and is ascending the wheel – it represents the unifying of opposites. He is also the initiator – the one to set things in motion. And here is the intentions we put out for our lives and the actions to this point that influence the current trends. Hence breakthroughs this card can bring are often the result of your own inner work, now manifesting externally. The Typhon represents the energies of the underworld and of darkness and is connected with salt alchemically. It is like the darkness has passed for the moment – possibly to return again later on when things unfold more. It is also representing what has had to be destroyed in order to bring you to this place. It is the death you have recently experienced in yourself that has allowed you to get the possibility of dramatic change for the better that this card heralds. The stars are representing the universal force acting upon the Earth miracles can be expected with this card, divine intervention can be seen. Often though set up as the result of a series of personal actions and intentions, the universe then comes to meet us at the last stage of the journey. This card is about the changes that happen all the time in the universe – our cells die and are renewed, rivers flow to the sea become cloud and then rain and form rivers. Cycles of life are represented here in all forms.